Jewelry Insurance – Protect your personal jewelry collection today! TQ Diamonds is partnering with Sure, a leading insurance technology platform. We offer a Jewelry and Watch Insurance Policy through Markel Corporation, who has over 25 years of experience in the valuable collectibles space and are A-rated by AM Best. Content and associated insurance products are provided by Sure HIIS Insurance Services, LLC (“Sure”), a licensed seller of insurance. The above does not in any way constitute an endorsement or referral by TQ Diamonds of Sure’s products or services. Products may not be offered in all states. Purchasing a policy on your engagement ring, wedding ring, and/or diamond may sound unromantic, but nothing's sweeter than peace of mind. There are a few ways to insure your engagement ring. 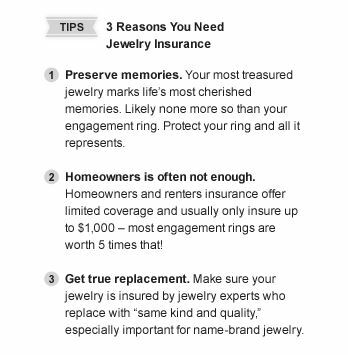 Jewelry insurance can be purchased as an extension (also called a "rider") to your renters' or homeowners' policy. Renters' and homeowners' policies cover the stuff in your home, but only up to a certain dollar value: Expensive, special items like engagement rings, art, and electronics are guaranteed through "scheduled" personal property coverage -- an insurance policy extension that covers particular items. Another option is to insure your ring through a company that specializes in jewelry insurance, which might offer more coverage than a standard homeowners' policy (replacing a lost or stolen ring rather than paying a set amount of cash, for instance). All your wedding presents may drastically increase the dollar value of your "stuff". Make sure to adjust your homeowners' or renters' coverage to reflect that! Any couple or individual with jewelry that has high material or sentimental value -- whether your wedding and engagement rings cost $1,000 or $100,000, an insurance policy is a way of honoring not just their financial value but what they represent. The sentiment behind your rings is priceless, but the rings themselves can be replaced -- if they're insured -- in the event that something happens to them. You'll need to provide your receipts, as well as an appraisal (which costs a small fee; you can get an appraisal from a certified gemologist – no charge for your appraisal when you purchase your engagement ring, wedding ring, or diamond from TQ Diamonds). And remember: If you move after the wedding, make sure your "ring rider"/policy follows you. Some couples have the ring insured at the bride's house (or her parents') before the wedding, and forget to add it to the policy for their new home when they move in together – contact your insurance agent or policy issuer when you change your address. These kinds of policies can vary widely company by company, so ask specific questions about the level of coverage provided. How will the company replace the ring -- with a check? Or will they require you to purchase a replacement through a specified jeweler? What if it's a vintage ring or other unique piece? How will the quality and size of your diamond -- and that of a replacement if needed -- be documented? The yearly cost to insure your ring is $1 to $2 for every $100 that it would cost to replace. In plain English, this means that if your ring would cost $9,000 to replace, you might expect to pay between $90 and $180 per year to insure it -- or slightly more in cities where the risk of theft is higher. When you shop for a "ring rider" policy, make sure to read the fine print: A good policy will cover every potentially ring-threatening situation from theft to damage to accidentally dropping it in the garbage disposal.